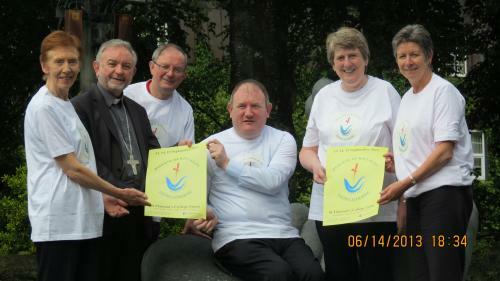 Over 700 people are due to attend the Killaloe Faith Gathering this weekend in Ennis. The event is the culmination of a two-year listening process which produced the ‘Killaloe Diocesan Pastoral Plan 2013 – 2020’ and which was officially launched last night. Today, the Faith Gathering continues with key note addresses from Fr Dermot Ryan on Faith in a Changing Culture, and Breda O’Brien, Irish Times columnist and commentator, on Being a Catholic in Ireland Today. Participants will also have the opportunity to take part in two workshops from a choice of twenty-seven, on topics as diverse as God in the Movies, Faith on the Web or Faith and Doubt – a workshop led by the former Bishop of Killaloe, Willie Walsh. During the Faith Gathering, each participant will be presented with a beautiful 78 page book entitled ‘Sacred Places of Killaloe Diocese’. Every parish in the diocese was asked to nominate a place of sacred presence and memory, and these are brought together in the book. This ‘faith passport’ briefly explains the significance of each place – monastic site, cemetery or holy well, and gives a spiritual ‘smaoineamh’ for reflection. At the back of the book are pages for ‘passport stamps’. The nearest parish office to a particular site will stamp the ‘faith passport’ after the site is visited. The Killaloe Diocesan plan, ‘Builders of Hope’, which was launched last night, is the fruit of a rich consultation with almost 1,000 people – clergy and laity, meeting in twelve centres across the diocese. It contains a vision statement and lines of action for – leadership for renewal in the local church, partnership in ministry, liturgy, spirituality & prayer, youth ministry, adult faith education, justice, peace & the integrity of creation, diocesan safeguarding services and communications. Killaloe diocese has a population of 115,000 Catholics, with an estimated 40% of these going to weekly Mass. The listening process identified key areas like the involvement of people in the ministry and life of the Church, and evangelisation especially of young people and parents of young children. “Handing on the faith was a key theme,” Fr Brendan Quinlivan said. A survey in March of this year established that only 7% of Catholic 20 to 30 year olds in the diocese were attending weekly Mass. For this reason, the findings of a survey of over 1,000 young people in the diocese (also part of the Diocesan Pastoral Plan), was of particular relevance. The 1,041 young people surveyed recommended a greater consultation of young people in the life of the Church, the organisation of specific events for them, with “a sense of fun”, greater creativeness around liturgy, and meetings with young people “where they are” (schools, colleges, sporting and musical events). They also asked for more use of social media, and for teachers, chaplains and those involved with youth, to engage young people in more opportunities to volunteer locally, nationally and internationally.